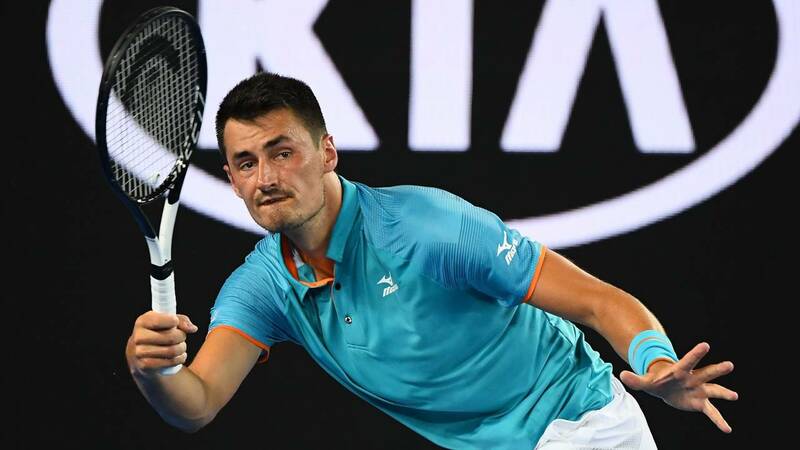 Bernard Tomic during his first-round match loss to Marin Cilic during Day 1 of the 2019 Australian Open on Jan. 14, 2019, in Melbourne, Australia. (CNN) - It's all kicking off in Australian men's tennis. Again. And no, it isn't Nick Kyrgios at the center of the brouhaha. Rather, it's another player who has made headlines for the wrong reasons -- Bernard Tomic. The once can't-miss prospect heavily criticized the country's Davis Cup captain Lleyton Hewitt following a first-round defeat at the Australian Open, saying "no one" liked the two-time Grand Slam winner. He also questioned why the 37-year-old continued to line up in doubles having ended his singles career here three years ago. "I thought he was retired," he said at Melbourne Park following his defeat. "I'm going to say it honestly, no one likes him anymore. He's playing Davis Cup. I thought he was retired. He's playing all these matches and stuff like this. "He used to hate Tennis Australia," Tomic added, referring to Australia's tennis body. "It's weird. And now he loves them. What's happened here?" He added that Kyrgios and Thanasi Kokkinakis -- once a bright prospect derailed by injuries -- didn't want to play under Hewitt in the team competition, which kicks off again when Australia hosts Bosnia-Herzegovina in the revamped men's team competition next month in Hewitt's hometown of Adelaide. The stinging attack came a year after Tomic dismissed criticism in the wake of a qualifying loss at Melbourne Park, countering that he'd instead be going off to count his "millions." The saga escalated further when Melbourne's Herald Sun reported Wednesday that the world No. 88 once threatened Hewitt with violence. "Two years ago I said, 'If he ever tries to talk to me, I'll knock him out,'" Tomic told the newspaper. The two Australians were once close, with the gritty Hewitt acting as a mentor to the 26-year-old. But those ties seem to be broken, with Tomic letting rip after he was ousted by last year's Australian Open finalist, Marin Cilic, in straight sets Monday. Despite his countryman's protestations, Kyrgios -- himself a straight-sets loser to Milos Raonic -- said he would be available for Davis Cup selection. But while the slumping world No. 52 said there was "not really" a rift between himself and Hewitt, it was far from the backing he gave two years ago. "I think he's the best captain we've ever had," the Canberra native said of the former world No. 1 back in 2017. "I know that everyone on our team would run through a brick wall for him." However when Kokkinakis -- overlooked for an Australian Open wildcard -- was asked if he supported Hewitt remaining as captain, the 22-year-old replied: "I'm not answering that." Hewitt didn't seem fussed about Tomic's comments. In fact, he had a "bit of a laugh." "It's Bernie being Bernie, especially after a loss and going in and complaining about a few things," he told CNN affiliate Channel 9, in its first year as host broadcaster of the Australian Open. "For me, I just laugh it off and move forward and obviously working with so many of the guys so I am excited." The former No. 1 denied there was a problem between himself and some of his players. "I don't think that there's a rift," said Hewitt, a longtime friend of 20-time Grand Slam winner Roger Federer, who is gunning for a record seventh Australian Open title. "There's always communication going on between the captain, the coaches and the players and leading into the next tie that will all happen." Among his other indiscretions, Tomic -- the former top junior -- was fined at Wimbledon in 2017 for admitting he was "bored" on court. That came after he attempted to return a serve with the handle of his racket in Madrid a year earlier. Despite claiming he would become No. 1 in the senior ranks, Tomic's ranking slumped from a career high of 17th in 2016 to 243rd last season. He won a title in China in late September to earn direct acceptance into the main draw in Melbourne but didn't seem in any rush to get back to winning ways. "I don't want to play too much because there is better things to do than play tennis, so we will see," he said.